Nakata receives variety of requests from variety of customers. We provide services designing a new manufacturing line for high quality and high grade pipes, introducing the latest forming mill in an outdated production line, finding resolutions for problems in existing production line, or designing hardware and software. We developed the most advanced FFX Mill supported by our proprietary FEM technologies. Our wide range of services include guidance for equipment installation, quality and production control assistance, etc. Nakata believes our products and services are the best solutions for our customers. High performance forming technology can handle thinner, lightweight, harder materials that the market wants. We use FEM analysis and the latest computer aids (CAx) to develop the best forming method that produces high quality grade tubes and pipes market requires. Our everyday efforts to pursue the most advanced technology respond to vast customer requirements. From the entry to the finishing section, we can meet your budget requirements. 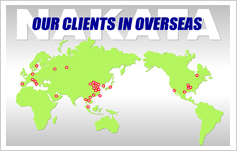 Nakata has many partners in the North America, Europe, China and Korea. We collaborate with them to design custom production line that meets customer budget and special requirements. Do you have welding problems and high defect rates in the current equipment? We provide technical consulting service for quality control, production control, etc. Please let our experienced engineers help you solve problems in your existing equipment or provide operational training. Wonderfully effect for pipe production with laser welding! ODF technology achieved record-breaking laser welding speed 30m/min of galvanized steel pipe production.